4 oz /113 g $12.69 ORGANIC. Ingredients : Almond Butter expeller pressed from raw almonds, refined, then hydrogenated for spreadability. No preservatives. 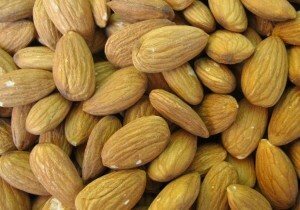 Almond Body Butter is the best moisturizer for neck firming. It is far more effective than the chemical-drenched creams on the market. 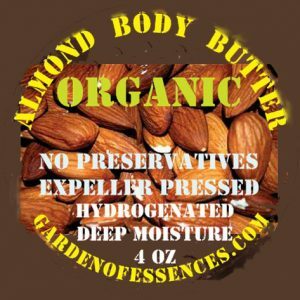 Almond Butter is superbly penetrating, creating a youthful, thicker skin, due to softening sterolins, for the best anti-aging cream you will find. Vitamins A, B, E, and minerals, provide antioxidant and anti-wrinkle activity, while you enjoy a preservative free massage cream. May calm dermatitis, as it is anti-inflammatory. This makes it the best Organic Massage Cream, for clients with sensitive skins. Almond Butter drenches the hair with sustained moisture, preventing breakage. Apply this preservative free hair conditioner to damp hair, by scrunching. Almond Butter is the top cream for crepey neck skin. HOLIDAY GIFT IDEAS FOR WOMEN 2016, where you can find other aromatherapy gifts, and a variety of unusual gifts, from clothing to kitchen.